Using light and shadow to create a modern space, The LIT Bangkok Hotel offers stylish accommodations in Pathumwan. In addition to a sunny mezzanine pool, it has pampering spa services and free Wi-Fi. During the day sunlight extends to every corner of the room, while contemporary light fixtures transform rooms at night. Each is comfortably equipped with a flat-screen TV, DVD player and minibar. 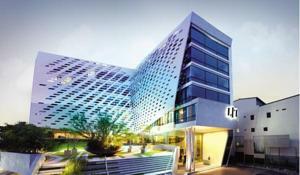 The LIT Bangkok is a 10 minute walk from shopping at MBK Shopping Center and Siam Paragon. It is a 25 minute train ride, or 40 minute drive, from Suvarnabhumi International Airport. Kiriya Spa offers a relaxing break from fast-paced city life with relaxing massage, hot tubs and steam baths. Health-conscious guests can work out at the gym. The classy restaurant, Fiesta Steppe, serves all-day international cuisine accompanied by city views. Premium wine and cocktails are available at its bar. Free! One child from 4 to 12 years stays free of charge when using existing beds. Free! One child under 2 years stays free of charge in a baby beds. There is no capacity for extra beds in the room. The maximum number of baby beds in a room is 1. Any type of extra bed or crib is upon request and needs to be confirmed by management.